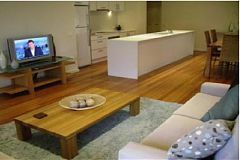 The unit is near new with blackbutt hardwood floors throughout the living areas a modern galley kitchen and two well appointed bathrooms. The unit has three double bedrooms and we have outfitted it so it will sleep 7 to 8 adults and children comfortably (2 families). All beds have doonas/blankets & pillows. Bed linen and towels are not provided. The master bedroom has its own shower, vanity and toilet. The common bathroom includes a shower, toilet and bath. There is also an internal laundry with washer and dryer. 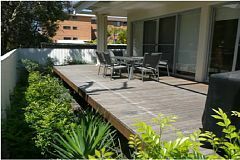 The unit is ideally located on the ground floor with extensive wooden decking, gardens and even a small grassed area. The kitchen is modern with all the appliances needed for a beach holiday or even an extended stay. 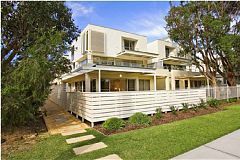 There is an outdoor shower to clean off the salt and sand after a day at the beach, BBQ and dining table on the wooden decks for outdoor dining. Under the unit is a secure garage for all unit owners to park their cars and Unit 3 has two allocated spaces. Access from the garage is either by lift of stairs. Hawks Nest is a quiet town of about 1,300 people and is a 2.5 hour drive North of Sydney along the main Sydney to Brisbane freeway. 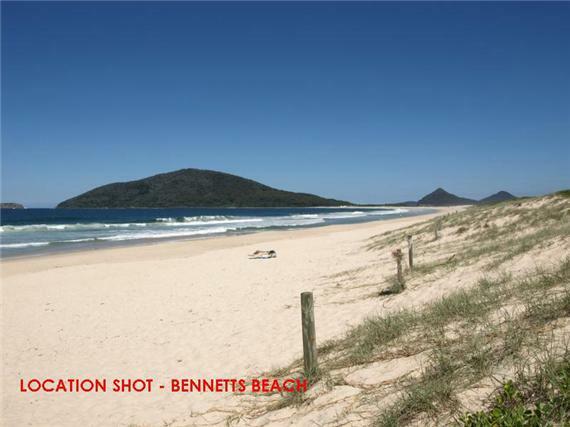 Access to the beautiful Bennetts beach is just a two minute stroll and the surf life saving club is also only a couple of minutes away. This means that adults and children can safely swim between the flags. The beach is over 30km long and 4WD vehicles are allowed to drive on the beach once a permit has been purchased from the local shops.The unit is also only a 15 minute walk or a five minute bicycle ride to Windy Woppa beach which is a non-surf beach facing Port Stevens.Only a 2 minute walk from the unit is a small hotel with restaurant, pizzeria, and DVD hire store. A further 5 minutes along the footpath is the Myall Lakes 18 hole golf club with bistro restaurant. Hawks Nest also has a number of shops (including pharmacy, general store, bakery, restaurants and small supermarket amongst others) about 10 minutes walk from the unit.Hawks Nest is a 15 minute bike ride or 5 minute car drive to Tea Gardens where there are boats and kayaks for hire to explore the extensive Myall River and Lakes system. Recreational fishing in this area is also very popular. 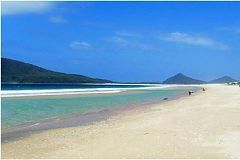 A holiday at Hawks Nest gives the opportunity to swin at either surf or non-surf beaches, kyaking, fishing, dolphin and whale watching (at the right time of year), walks in National Parks and plenty of bicyle options. The two single beds can be joined to make a king bed. The "childrens room" has two double bunks and a mattress that can be pulled out to make room for a fifth. We suggests the maximum comfortable fit is 8, but it is possible to add another child. Higher rates in the summer. The property is professionally managed. Cleaning is typically $100 AUD per visit. Linens and towels are not included, but can be arranged upon request for $20 AUD per person. The unit is located on the ground floor with level access from the road. The two parking spaces below in the garage can access the unit by a lift. It may be difficult to use if one is restricted to a wheel chair. There are no rail or air links to Hawks Nest. The best way to get there is by car up the freeway from Sydney. Once in Hawks Nest most things can be done by walking or on a bicycle. 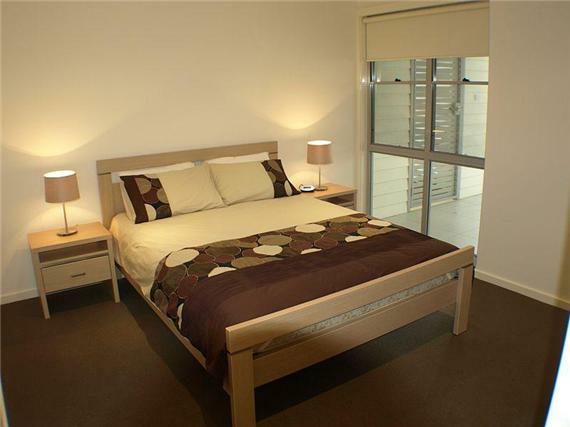 One of the highest specification apartments in Hawks Nest built in 2006. Just a short stroll to the fantastic beach.